Wines pair very well with desserts if you select the right combination. A good pairing enhances the flavors in both the wine and the dessert. Trying these pairings is an excellent way to take your dessert to the next level. Desserts such as dark chocolate torte, dark chocolate mousse, or dark chocolate truffles all pair very well with different wines that complement the rich, bittersweet flavors. You have all kinds of wine options ranging from sweet, fruity wines to dry reds. Many wineries make raspberry, strawberry, and other berry wines. These wines are a beautifully classic flavor combination with dark chocolate desserts. Chocolate and berries go very well together, and the sweetness in the wine balances the bitterness of the chocolate perfectly. This one may seem like a no-brainer, but chocolate pairs well with chocolate. Creamy chocolate wines, like Chocovine, have a light, milk chocolate flavor with a warmth that tastes almost like a fortified wine. These sweet, creamy wines are great with dark chocolate because they tone it down while still offering complementary flavor profiles. This bold, dry, spicy red from Australia often has big, bold, fruit-forward flavors that taste like berries and jam. While Shiraz is dry, the fruit flavors complement the dark chocolate well while the tannins cut through the fattiness of the dessert. 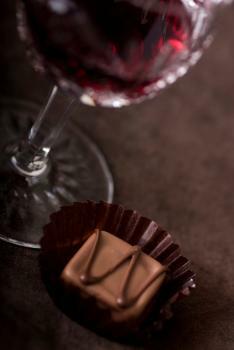 The wine's dryness also balances the sweetness of the chocolate while the jam flavors smooth out any bitterness. This rich, creamy vanilla custard topped with burnt sugar makes the perfect finish to a meal. Pairing it with a dessert wine makes the dish even more delicious. The most classic wine pairing for a crème brûlée is sweet white wine from the Bordeaux region. Both Sauternes and Barsac wines are made with Semillion, Sauvignon Blanc, and Muscadelle grapes that have been infected with botrytis cinera. This fungus adds layers of complexity to the wines while the lateness of the harvest means the wines have a high residual sugar content. The result is a lush, sweet wine with tropical flavors and a nice balanced acidity that perfectly complements the vanilla custard. This white varietal has a slight sweetness to it. Typical flavors in Muscat wines include apricots and almonds, which complement the lush vanilla custard. Pairing a Muscat with crème brûlée also brings down the sweetness of the custard just a bit because although it has a slight sweetness, it isn't over the top like other dessert wines. This German dry white might seem like a surprising choice with a rich crème brûlée, but when you look at it terms of flavor and balance, it really makes sense. Gewürztraminer is a dry, spicy wine with nice acidity. The acidity cuts through the fat of the custard while the dryness of the wine helps balance the sweetness of the dessert. The spice of Gewürztraminer brings character to the mild vanilla flavors of the crème brûlée. This is a great wine choice for people who like their desserts slightly less sweet. Apple pies are sweet and spicy. Typically, wines that pair well with apple pie will also pair well with other apple desserts, such as apple brown Betty, apple crisp, and baked apples. Riesling from Germany comes in multiple levels of dryness and sweetness. The three best choices for apple dessert pairings are (from the least sweet to the sweetest) Kabinett, Spätlese, and Auslese. 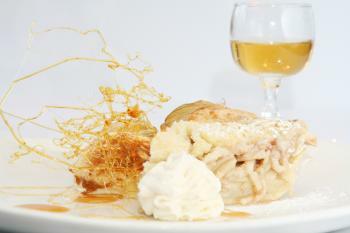 Riesling tends to have very high acidity, which cuts through the sweetness of pie well. It also has a lightly spicy character that blends with pie spices. Finally, the flavor profile of Riesling often favors apples, pears, and other tree fruits, which blends well with the flavor of apples. If you prefer less sweetness in your wine to balance the sugar in the pie, choose a Kabinett. If you want a lot of sweetness in your wine, choose an Auslese. Prosecco is a lightly fizzy Italian wine similar to Champagne. Prosecco comes in varying degrees of sweetness. To balance the sweetness of the pie, choose an off-dry Prosecco, which is lightly sweet but not overwhelming. Prosecco is crisp and acidic, which matches the acidity of the apples in the pie. This Italian white is slightly fizzy with a light sweetness. It also has nice fruit flavors like apples and pears, which balances perfectly with an apple pie. While Moscato d'Asti is slightly sweet, it isn't overpowering, so you won't be layering super sweet on top of sweet. Because lemon desserts such as lemon meringue pie are inherently acidic, you can pair them with wines that are quite sweet. Ice wines are made from white wine grapes harvested after the first frost, so the sugars have concentrated. This makes ice wines deliciously sweet. This sweetness balances the acidity in lemon desserts, making a perfect and delicious pairing. Late harvest white wines are made from grapes harvested late in the season. Therefore, the wines tend to be relatively low alcohol but higher in residual sugar. These wines range from slightly sweet to very sweet. Try a late harvest Viognier or Chardonnay, which tend to have citrusy flavors that will complement the lemon well. A dry Champagne will also pair well with a lemon meringue pie. The biscuity flavors in Champagne match the flavors found in the crust while the toastiness of Champagne matches the browning of the meringue. Finally, Champagne tends to be dry, which will balance sweet flavors in the dessert. Pumpkin pie and other pumpkin desserts tend to be sweet, creamy, and spicy. Many wines pair well with these flavors, balancing the creaminess and complementing the spice. Tawny Port has a golden color and a warm, rich flavor. The fortified wine tends to be sweet, but it also has wonderful caramel and spice flavors that perfectly complement the pumpkin and spices. The high alcohol content balances the creaminess of the pumpkin custard. This is a fortified wine similar to a tawny Port. It has sweet and spicy flavors as well as an appealing golden color. The flavors of this wine are often described as warm, raisiny, or toffee-like. These warm flavors mix well with the warm spices in pumpkin pie. This fortified wine from Portugal comes in varying degrees of sweetness, from dry to sweet. 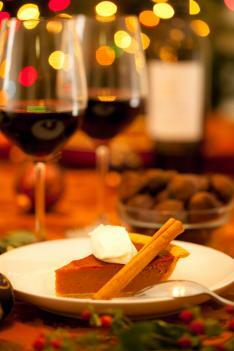 Choose a sweet or semi-sweet Madeira to pair with your pumpkin dessert. Madeira tends to have smoky, spicy, and nutty flavors, all which match well with pumpkin. The high alcohol content also balances the creamy custard beautifully. Many wines will complement tiramisu and other coffee-flavored desserts. Coffee is a flavor that blends well with different flavor profiles. This sweet Italian dessert wine has a pretty golden color. It tastes of nuts, such as hazelnuts with a touch of sweetness. Nuts and coffee go extremely well together, so a Vin Santo will balance out the coffee-flavored tiramisu beautifully. Cream Sherry is a sweet, fortified wine with a mahogany color. It has nutty flavor with a touch of sweetness that balances the bitterness of the coffee flavors in tiramisu. This fortified wine has a deep burgundy color and a complex sweetness. Ruby Port tends to be fruit forward, with flavors of berries taking the forefront. It also has subtle undertones of nuts. The flavor of berries and nuts are the perfect complement to coffee flavors. While the above suggestions can help you start, there are no hard and fast rules for pairing wines and desserts. Choose wines you love with desserts you love. Seek flavors that balance each other and wines that help you achieve your desired level of sweetness, and you'll wind up with a delicious pairing.